Rokuro Enmado is a young boy who used to be a powerful aspiring exorcist, before a tragic incident left his friend dead and made him abandon the profession. One day, he has a fateful encounter with Benio Adashino, a girl around his age and a well known exorcist from the east. 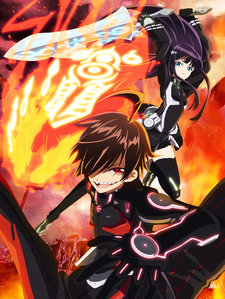 According to prophecy, Rokuro and Benio are the "Twin Star Exorcists", and are destined to marry and have a child which will be the ultimate exorcist, capable of cleansing all evil spirits, or Kegare, from the world. When Rokuro's best friend Ryogo goes missing, Rokuro is forced to ask Benio for help to enter Magano, the realm of the evil Kegare, to rescue him! If you're looking for a show filled with comedy, romance, action and emotional scenes, this is for you!